A: Unfortunately, the reality of our agricultural production does not allow us to welcome visitors to the farm. If you are interested in visiting, we invite you to join our Loyalty Program, which gives guests access to our farm visits. Click here for more information. Q: Can I buy products directly on the farm? A: We do not currently have a farm store. Click here to discover our points of sale. Q: I am a restaurant manager/chef and would like order your products. A: Please visit the Orders page to learn more about how to order our farm fresh products. Q: Can you support me in my agricultural project? A: The farm team is completely occupied by the management of our project and it is not possible for us to allocate consulting time on other projects. 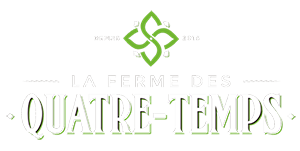 La Ferme de Quatre-Temps is already contributing to various organizations through the promotion of small-scale agriculture in Quebec. Q: I want to do an internship or work at the Farm. A: Please visit the Employment & Internships page to find out when and how to apply to work at the Ferme des Quatre-Temps. A: Please visit the Points of Sale page to learn more about our outlets. A: We are in process acquiring our organic certification. We do not use fertilizers, chemical pesticides on our crops, nor do we use antibiotics on our animals. If your question has not been answered, please fill out the form below and we will reply to you shortly.